Which Breast Hormones Have the Greatest Effect on Breast Growth? With the exception of certain medical conditions, the largest amount of estrogen the female body will ever produce occurs during puberty. It is no coincidence that this is also the time in a woman’s life when she will see the quickest and most dramatic breast growth. Pregnancy is another time when the female body produces an increased amount of estrogen. In order to prepare the body for breastfeeding, the heightened estrogen levels influence certain tissues in the breast to grow and eventually fill with milk to nourish the child. Each month during a woman’s ovulatory cycle, the ovaries initiate a mini-spike in estrogen levels. This is by no means as dramatic as it is during puberty or pregnancy, but it is significant. The body does this in an attempt to prepare for a possible pregnancy and the higher levels of estrogen circulating within the female body influence the breasts to grow slightly. For women who experience swelling and tenderness in the chest around “that time of the month”, this is the primary cause. While estrogen works to increase the overall size and amount of breast tissue, progesterone goes to work on the cells that are responsible for growing milk ducts. Progesterone and estrogen are strongly linked during a woman’s monthly cycle. Levels of this hormone spike significantly during the first half of the month and eventually decrease if a woman does not become pregnant. In addition to larger breast development, increased levels of progesterone can have other health benefits as well. Some of those include a happier mood, a decreased chance of developing osteoporosis and reducing susceptibility to certain types of cancer. Prolactin is the main hormone that stimulates mammary tissues to produce milk. Oddly enough, this hormone’s production is not limited to pregnancy; it can also be found during the first few days of the female menstrual cycle. Like estrogen and progesterone, the presence of prolactin within the female body affects the size of her breasts. Although only slight, it will cause the breasts to expand for a few days. During the early part of pregnancy, it is mainly estrogen and progesterone that are responsible for engorging the breasts; after the child is born prolactin kicks in and maintains the increased breast size by filling the mammary glands with milk. You may have heard oxytocin called “the feel good hormone”, primarily because of its role in creating emotional bonds between humans. 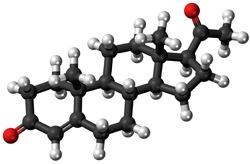 Many believe that oxytocin is the chemical origin of what humans refer to as “emotional love”. Oxytocin also affects breast development by stimulating milk production.It works alongside prolactin and is even secreted by the same part of the brain, the pituitary gland. Oxytocin is responsible for the deep emotional bonding that comes from breastfeeding. Hormones For Natural Breast Enhancement? If you’re looking for ways to use these hormones to improve the size of your breasts, then have no fear, there are several breast enlargement herbs that safely mimic the effects of these female hormones. We’ve reviewed and ranked the top products available today; have a look at our breast enhancement product reviews for more information.